Tribes Overall: "Despite the amount of travelling involved, our Peru trip was an excellent mix of culture, nature and history. It exceeded our expectations in almost all respects. We loved the trip!" Guides: "Ours guides, Gustav in Cusco and Milton in Puno were especially knowledgeable, professional and very helpful. Transfers were all excellent - very punctual and vehicles clean and a high standard." Social & Environmental Responsibility: "Were not impressed with the Uros Islands. There are now 85 islands which are a parody of the remains of a culture which has not existed for some time. We were shocked at the negative impact these islands have on the wildlife and environment.It seems to be a show put on for the tourist dollar. Every couple who have an "island" earn about $1500/month from tourist fees, hence the rapid expansion of the islands. Most of the people don't even live on the islands, they leave at 4pm when the tourists have left." Hospitality second to none but you need to be prepared for the lack of amenities and limitations of a homestay. Stunning views over the lake and watched the sunset from the top of the hill. Arrived late and tired so ordered room service - very overpriced and meal size extremely small. Breakfast very chaotic as hardly any staff so tables not cleared and reset. Hotel location very convenient. Arrived before check-in time so had to wait in reception for about 3 hours. This was longer than expected as it is a fairly large hotel and we saw lots of guests check-out as we arrived. Room and location very good. Breakfast very chaotic, again due to shortage of staff. Tables not cleared and reset, so nowhere to sit. Problems seem to be due to large tour groups almost taking over parts of the hotel at different times. Accommodation is very basic and a bit tired. Meals are excellent (good chef) especially considering the location. Journey by canoe is long but worthwhile to give access to the clay lick. Also saw tapirs, capybara; and blue and yellow Macau\'s and toucans when we climbed the big tree at sunset - the view above the canopy was stunning but beware if you don\'t like heights. Money went missing from our room which we have reported to you. The room was small but the location excellent and the restaurant very good. The hotel, grounds and location are stunning, as is the food. We were upgraded to the most amazing suite, which was appreciated after the heat and humidity of the rainforest. "Amantani Homestay - an amazing experience due to the interaction it allowed with a lovely family whose way of life is so alien to ours. Surprisingly good, simple vegetarian food cooked on an open fire in an adobe house. Will always remember using a sink that was not connected to a waste pipe such that the waste emptied onto my feet!" "Heath River - the clay lick was the highlight and worth the 4.30am start. Spent hours watching the intensely colourful array of birds from the floating hide, a sight not to be missed. Machu Pichu - Arrived in torrential rain but once it slowed and the mist cleared, the sight of MP exceeded our expectations. No matter how many photos you see of it, its size and location is overwhelming." 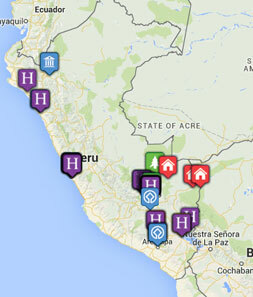 Start planning your tailor-made holiday to Peru. Tell us what you want, and we will tailor make your perfect trip.  Flight time: Both KLM and Iberia have flights to Lima via Europe, leaving the UK early in the morning to arrive in Lima in the evening. The flight time is about 14 hours. It is also possible to fly to Lima via America.  Language: Spanish and Quechua are the official languages.  Visas: Not required for British travellers (up to 90 days). EC nationals can ask us for further advice.